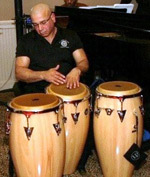 Pedro Perez began playing conga in the early 1970s and studied with master drummer Daniel Barrejanos. He has continued to develop his music, playing for such groups as Walter Nicks Jazz Dance company, Shamus Murphy's Jazz Experience, Nuyorican Baile, and KUUMBA Afro-Caribbean Dance & Drum. He is currently playing with Out of the Box, Marcus Beniot, and Las Manos. He has often taught youngsters how to play the conga using the opportunity to connect them with their heritage, providing them with a creative outlet, and hoping they will construct for themselves a wholesome and positive life through the music they have learned.